Former Croatian Prime Minister Ivo Sanader, who is wanted in connection with a corruption investigation, has been arrested by police in Austria. Mr Sanader left Croatia on Thursday shortly before parliament lifted his immunity from prosecution, and the authorities later issued a warrant for his arrest. Police stopped him on a motorway in western Austria. Mr Sanader says the accusations against him are politically motivated. "I didn't head a [criminal] gang, I headed the cabinet," Croatian news agency Hina quoted him as saying. Austrian officials said Mr Sanader was detained on Friday afternoon in the Salzburg region and brought to the regional justice court. "Our police tried to find him and we located him on the highway this afternoon," said Austrian interior ministry spokesman Alexander Marakovits. He added that the operation was carried out in conjunction with German and Croatian investigators. Correspondents say a judge will now have to rule on whether Mr Sanader should be extradited back to Croatia, but it is unclear how long this might take. The Croatian authorities submitted the arrest warrant to Interpol overnight, hours after Mr Sanader crossed the border into Slovenia. The warrant said he was suspected of conspiring to commit crime and abuse of office. Croatia is conducting a wide-ranging investigation into alleged corruption, designed in part to prove its readiness to join the European Union. 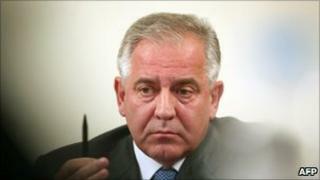 Mr Sanader, prime minister from 2003 to 2009, is the most senior official to be investigated so far. He resigned unexpectedly in July 2009 in the middle of his second term as leader. Last January he was expelled by the governing Croatian Democratic Union (HDZ) but he carried on as an independent MP.